All horses must have up to date negative coggins test, current vaccines and deworming. We know a healthy horse is more willing to learn and perform better than one that is sick, underweight, or not maintained. A good sound rotational deworming program that rotates between DRUG CLASSES not brands is recommended to ensure a healthy horse. We prefer that your horse is current on dental and farrier work. We do understand that young horses may not have had this work done before but we can assist with the horse getting these health requirements taken care of with help of our equine dentist and farrier at the owner's expense. 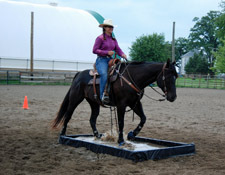 We offer foundation training for your special equine friend. We can take a colt from beginning to winning and anywhere in between. Our training program is well developed, tested and proven to be successful. We are very passionate about what we do and strive for the best with every horse. We take in a limited number of horses for training to ensure proper care and instruction time. We have numerous references regarding our training program. Every horse that comes in for training will go through our step by step exercises to be sure there are no holes in their background. This is most evident in problem horses that need to start over at "ground level" to progress forward. Once the holes are uncovered, then new roads need to be paved with clear understanding and encouragement towards the goals. It takes longer to remove bad habits then it does to start off with a fresh mind. .
With correction, we need to establish new rules and must instill additional training principles into the horse so they can move forward and not be stuck in a negative tunnel. 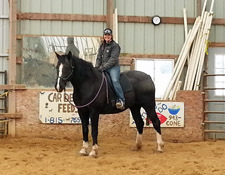 In training, if the horse understands and shows proficiency with a concept we move forward through each level to ensure them being fresh, focused and fun to be around. With positive praise, reward, correct direction to the desired behavior and discipline, the horse develops long lasting and deeply ingrained foundation skills. 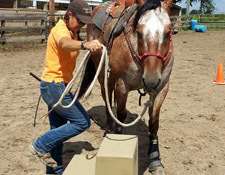 We highly recommend that horses in event specific training should learn the foundation blocks, and then move forward towards the desired discipline. Often a horse comes in for a tune up or conditioning and we find there are holes in its foundation that are causing issues for the horse and rider. Every horse can do every event, but to what extent depends on the horse's athletic ability, coordination, desire, and work ethic. In addition, we must consider the rider’s ability, experience and timing. For these areas can greatly enhance or inhibit the horse’s performance level. We are happy to show, season or compete with your horse for you. Ask about details. Our training and lesson principals are universal and instill a strong, solid foundation to help ensure a longer, successful career. A horse or rider with a deeply established foundation has the stepping stones to create a pathway for unlimited future possibilities. Good riding and solid training is essential in today’s competitive equine world. It all starts from a rider’s basic horse handling skills to their first rides which will set the standard for future success. We greatly understand this process and work hard to provide the depth and details within our lesson and training programs. No stone is left unturned when creating the building blocks. Every horse that comes in for training will go through our step by step exercises to be sure there are no holes in their background. This is most evident in problem horses that need to start over at “ground level” and progress forward from there. Once these holes are uncovered, we work hard to replace them with new guidelines and standards. This paves new roads for clear understanding of training concepts presented. It takes longer to remove bad habits then to start off with a fresh mind. This is because a “bad habit” engrained in a horse’s mind will take at least 30 days of constant repetition of “good” behavior for it to become a new habit. We have to determine what triggers the bad behavior, in order to change the bad habit. Then create new understanding of how to behave, and begin to ingrain that new “good “behavior into their mindset in order to make this a lifelong change. Training horses are started in the round pen. We are looking for them to be paying attention to the trainer. 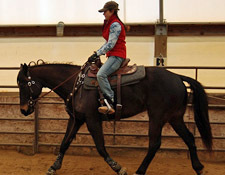 The horse should move its feet, body and gait based upon the trainer’s body and voice command. 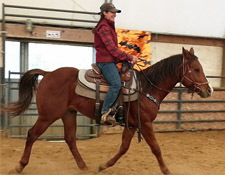 Often the round pen is used for many training sessions including some desensitizing, moving the body parts, ground driving, and first rides along with tune ups rides. Our hallmark is our solid foundation training principals that we put into every horse. We know we are building a lifelong bond between the horse and rider. Our passion is infectious and quickly spreads to our horses and students. Many horses and students have noteworthy successes in the showing community. More importantly, the learning, commitment, bonds, passion, respect, and depth of learning lifelong skills are displayed by our training horses and students and we are very proud of both! Every moment with a horse or student is a teaching opportunity. Therefore, we pride ourselves on our handling, foaling, training, showing and equine rehabilitation programs. We feel it is important to teach from the ground up. 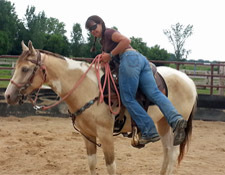 Students are taught how to halter, catch, walk, groom tack a horse properly and safely. 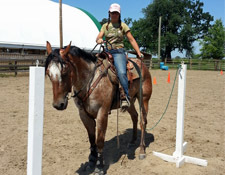 Students can learn ground work, problem solving, trailer loading, herd management, despooking, obstacle and trail course work, cattle control, roping, barrels, poles and down to their refinement levels of western dressage. 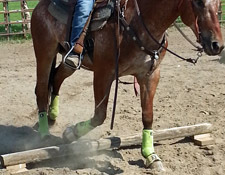 Years ago, horses were trained to do it all from halter to racing to reining to roping. That was the norm back then. As the economy rose, each event began establishing new associations, creating high demand for event specific horses. As specific events became more popular, people began focusing their training on the skills necessary for that particular event. The horse began to develop what it needed to know for them to show in their event and often did quite well. As time went on, horses began to wear down certain body parts. There was more over use, fatigue injuries, body soreness, inflammation and more, in these horses. This is when there seemed to be a spike in joint injections and combined supplements. I was in the middle of all this and looked around only to see everyone trying to put band aides on horse’s injuries. I began looking at these injuries and trying to figure out what can be done to prevent them. Not just mask them. 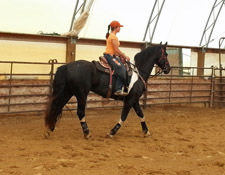 This is when I took my barrel horses and began working on gymnastic exercises with them using my dressage back round. I also combined my love of physical fitness and introduced cross training to my horses. 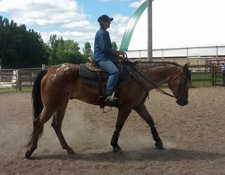 My barrel horse began dressage work, cattle management, roping, ranch rail riding and more. Soon, I had happier, sounder horses that were focused, obedient and eager to work. I gave them a variety of events to enjoy. 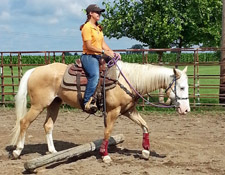 This worked many core muscles in a variety of ranges of motion, creating a better top line, stronger hindquarters, lighter front ends, open shoulders and fewer injuries and less inflammation. I have taken the concept of cross training from humans and applied it to my horses. I develop the horses in areas or events they are suited for and then encourage their development by combining cross training in multi-dimensional events and individualized skill sets. I have created a fresh minded horse for their sport, built stronger bodies, increased cardio fitness and re-created the horse that can “do it all” like those horsemen did years ago. In order to do this, we have taken the time and patience with each horse and I carefully allow them to progress in their development slowly allowing them to understand the concepts, keeping them soft, sound, willing, light in the hand, seat and leg. Horses are given time to ponder and relax during a training session which helps keep them fresh and engaged when being nudged to learn. We are constantly working on being soft and consistent with our cues and placing the time honored traditions of repetition and reward so vital to the horse’s proper physical and psychological development. Our training starts off with an extensive ground work program like no other. We continue to take steps forward and do not just stay on the ground. We feel the horse likes to learn new things and we take the time to introduce new concepts often. We know that a horse can understand softness, body cues, pressure and release, turning, voice commands, leg yields, desensitizing, moving the five body parts all before introducing the concept of the rider. Once a rider is on board, we work to perfect these areas. We nurture these concepts within the horse﻿ ea. We are building trust, establishing a bond and a working communication with each horse. I have found the best way to teach a horse is to first know their learning style and personality. Then use those concepts to introduce the lessons in a manner suited to their style. Once a horse is progressing nicely under saddle, we add in “cow time” and other event specific skills. Horses enjoy having something they enjoy doing and cows help nourish their instincts creating an alert, responsive horse that begins to understand why we ask for specific body part movements during their arena “dry work”. The horse begins to light up when they know its “cow time”.